Hire slow and stick to an open and honest discussion. Can you recall the moments before your first interview? Whether you thought of the first time you were interviewed yourself or the first time you interviewed someone, this memory wasn’t hard to access. On the prospective employee side you (hopefully) reviewed (and reviewed) your resume and turned up looking your best. On the employer side? You rushed in from a meeting, or squeezed a slot in between patients, or stuck this interview at the end of a long day. When you think about it, what you are doing is spending 30 to 60 minutes with someone to decide if you want to be responsible for their paycheck and see them more than your loved ones! Physical therapists are not trained in interview skills. We remember our own interview history. We make a few mistakes, hire the wrong person, then the right person, and over time we figure out how to spot a new team member. Of course, we pay attention to the simple benchmarks such as did they arrive on time, were they professionally dressed (by the way, do we expect an interviewee to wear a suit when all we wear is khakis and golf shirts? ), did they do their homework about your company? More nuanced traits such as work ethic, personality, and the ability to “go with the flow” are harder to tease out. Like a first date, everyone is on their best behavior. Physical therapy generally draws people who consider themselves, by default, a “people person.” Engaging the candidate in conversation is an easy way to gauge their comfort level, their ability to pick up on nonverbal cues, and to “sell themselves.” So much of physical therapy is connecting with the patient, garnering trust and building rapport. You only have a few minutes with a new client to establish yourself as a caring, knowledgeable, and kind health care provider. You have even slimmer margins on a phone call to connect as an administrator with a potential client. 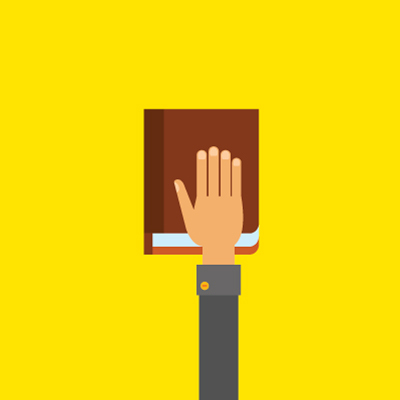 With a job candidate, asking benign, open-ended questions can drive the conversation toward gaining insight into their personality. A few expected questions (why did you want to become a physical therapist, what attracted you to our company) along with the unexpected (what makes you upset/happy) can test the candidate’s ability to think on their feet. Most people can talk about something they care about but have difficulty “selling” themselves. Asking “What are you passionate about?” can often get someone talking, which gives you a chance to see who they are and what drives them. 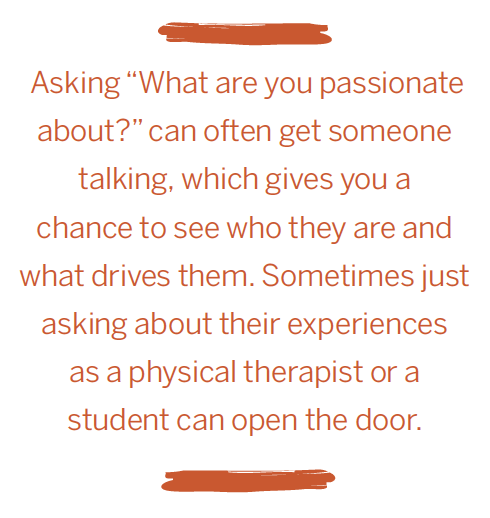 Sometimes just asking about their experiences as a physical therapist or a student can open the door. But did you know you are being interviewed as well? A good candidate should want to know as much about you as you want to know about them. They should ask specific questions about how your clinic runs and about the experience of being an employee. One of the best questions I was ever asked was “What frustrates you about working here?” For a few seconds of silence I wasn’t quite sure how to answer, but it was an honest question and it deserved an honest answer. An employer wants to know a candidate’s strengths and issues, and the candidate should want to know the same about you and your practice. As my interview skills evolved, it became increasingly obvious that honesty was the best policy. Sharing the daily grind, the things that aggravate you as the boss, things your current employees struggle with, the tasks no one wants to complete (who loves making sure paperwork is compliant?) may sound like a recipe for scaring off good candidates but actually empowers them to make a decision with all the cards in front of them. An experienced candidate will understand (generally the things we don’t like about work are independent of where we work and more about the work itself), and a new candidate will do themselves a favor to understand that the road might not always be smooth. Occasionally someone has a solution or new insights and a frank discussion might pay unexpected dividends. Eric Cardin, PT, MS, is a Private Practice Section member and executive director of South County Physical Therapy, Inc., located in Auburn, Massachusetts. He can be reached at ecardin@sc-pt.com.